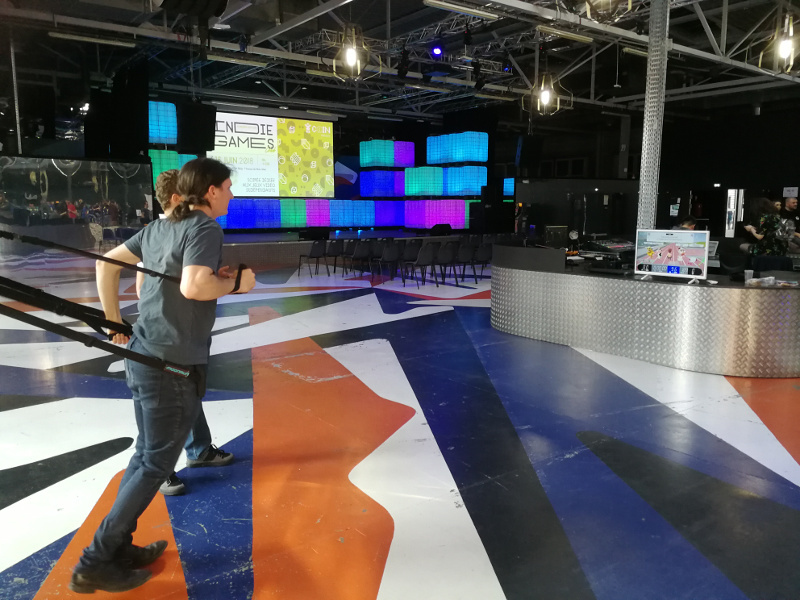 23/02/19 : Arcade Fitness 5 is now online! 21/12/18 : Arcade Fitness 4.4 (new version) for Windows is now online! 23/07/18 : Arcade Fitness beta for Windows can be downloaded online! Let's try Arcade Fitness for Windows, get the app online and join our Facebook group. 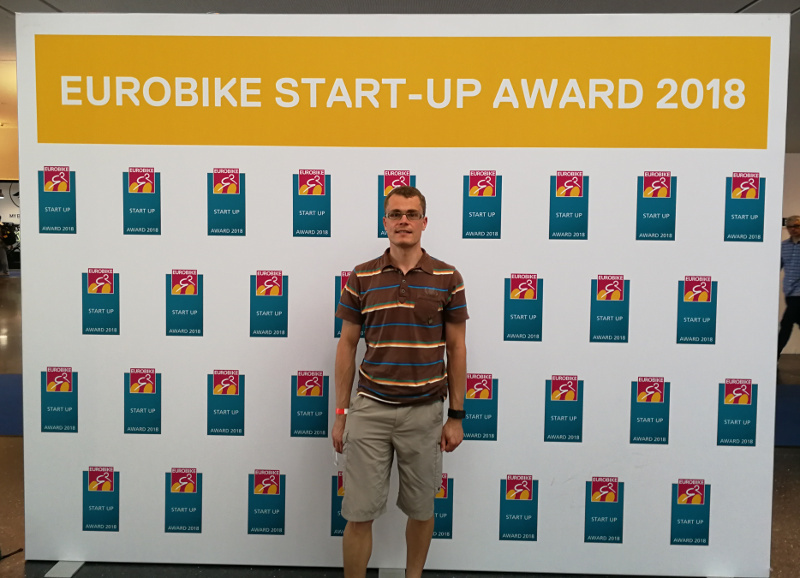 Arcade Fitness took part into the Eurobike 2018 startup challenge and was selected for the final round! See our 3 minutes pitch at Eurobike 2018. Let's ride or run together on 18th of June at 18:00 London time. 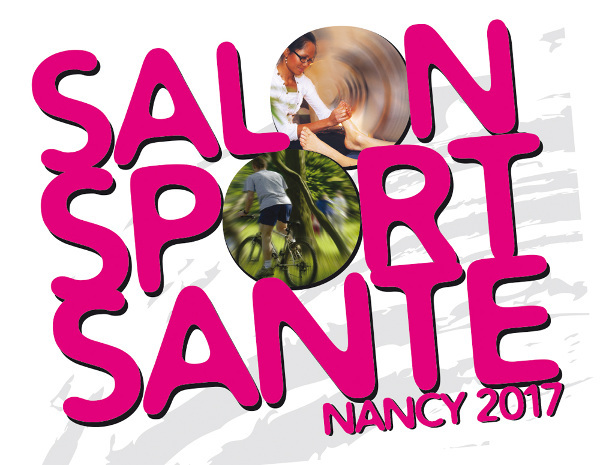 Meet us in La Bresse and try Arcade Fitness with MoonRun or bike trainer! 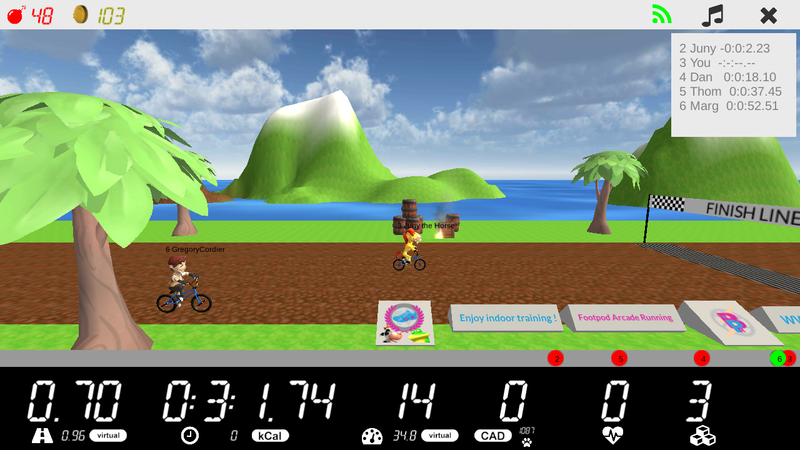 Try new Track 1k running / 3k cycling level! Here is an overview of next release which will be published in the next few days. Feel free to contact us if you want to get access to the beta version before it becomes official... There will be plenty of new features! 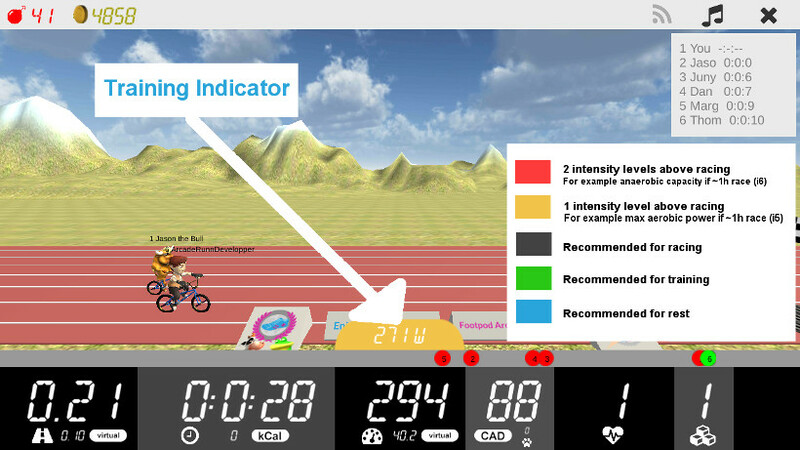 Test the new training indicator. This is a speed or power recommendation for the distance you choose... It will make you do your best effort or just help you train with intervals. You just have to go to "Settings Menu" and activate it. Take part into the castle challenge before 31th of december 2017! 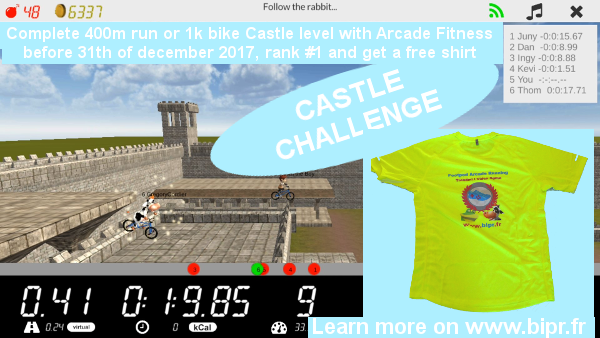 Run indoor with Arcade Fitness, get the best time in 400m run / 1 km bike Castle level and win a shirt! We need to be able to contact you per mail, that's why don't forget to log in on this website and complete your profile to take part into this challenge... Current best time is 3min23.87s (FreneticFighter74205). 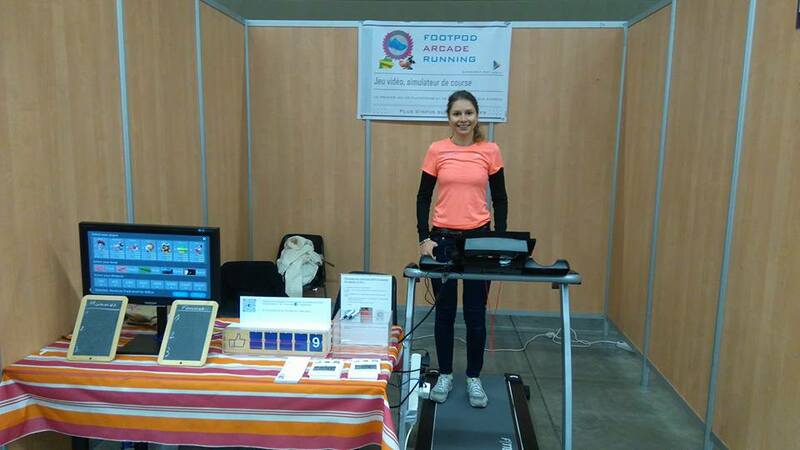 Met us and try Arcade Running Multiplayer with the MoonRun fitness system on 14th and 15th of October at Sainte Marie parc in Nancy. 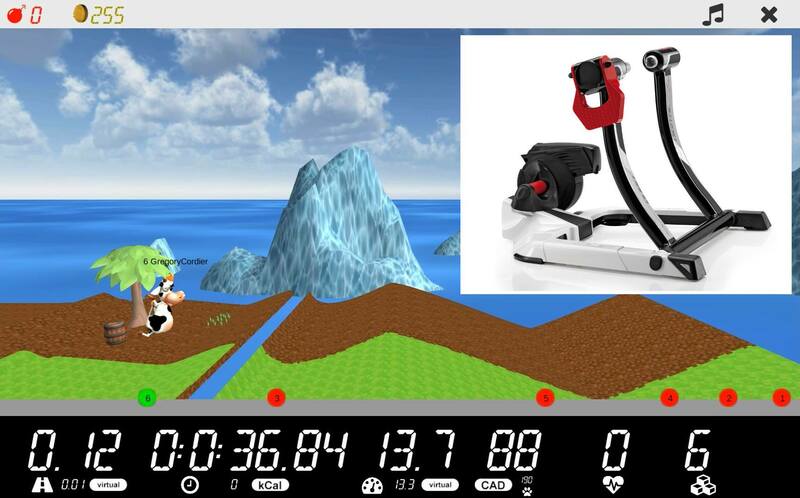 Get the latest release in order to race online with your ANT+ FE-C trainer and Arcade Cycling multiplayer. 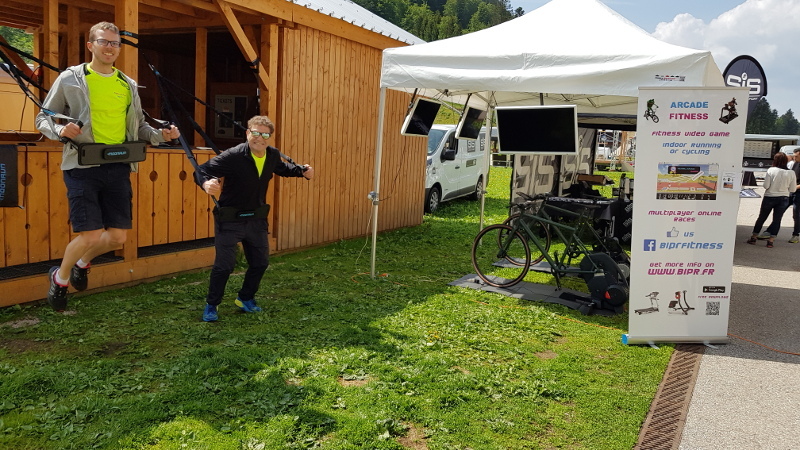 Meet us and try the brand new Multiplayer Mode at La Forestière MTB race this week and ! 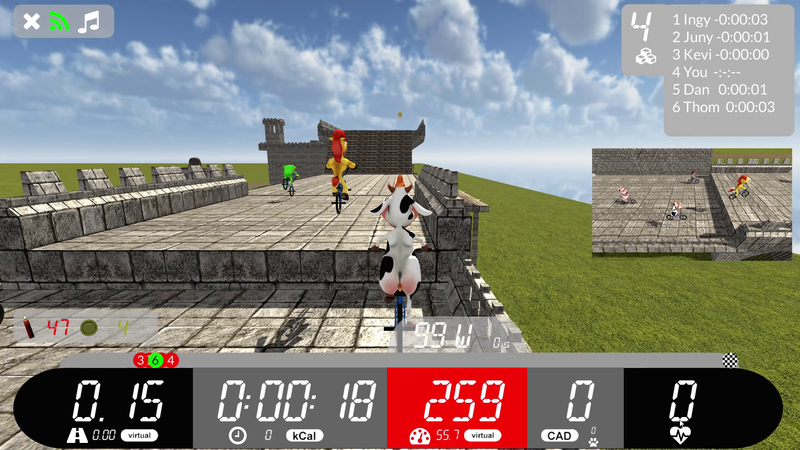 Have fun racing with friends in realtime while doing fitness workouts... 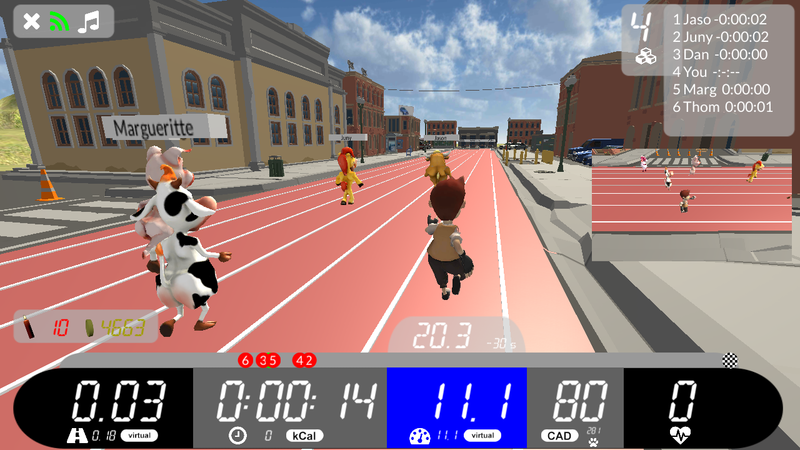 Try the free 100 meters running or 250 meters cycling multiplayer level. Take part into the summer challenge before 15th of August ! 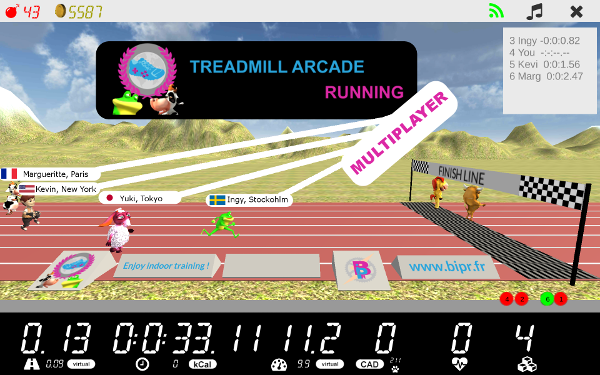 Run indoor with Treadmill Arcade Running, get the most total points among all players between 1st of July and 15th of August and win a shirt ! If you want to take part : login with Google+ on bipr.fr website and complete your profile with your name. Challenge is back! Run or ride indoor in May, publish your score publically on Google and if you get the most Total Points this month, you will get a running shirt as a present! Don't forget to log on our website and complete your profile... Good luck! Arcade Running V2.3 is now on the Play Store. Use the general Bluetooth Smart mode and get your running speed with Speed Transmitter holding your smartphone in your hand or in an arm band. 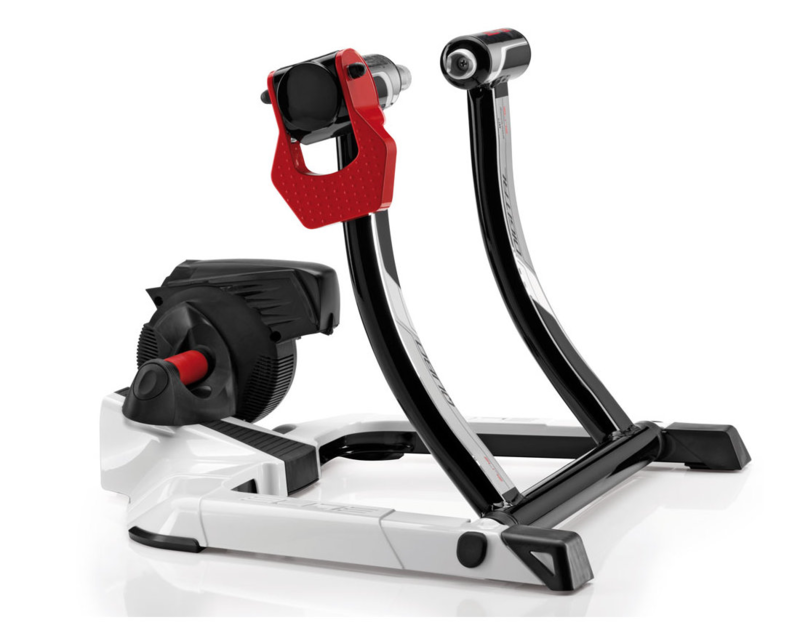 Speed Transmitter can also be used with Zwift and is free for 8 minutes workouts. 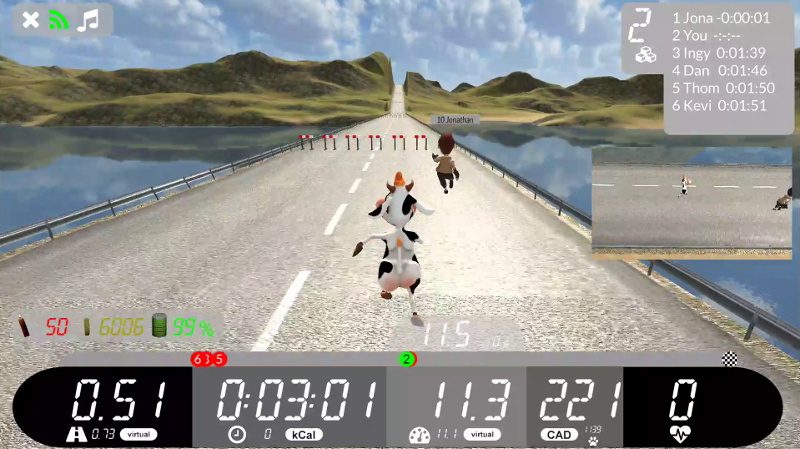 16/04/17 : Arcade Running, first running video game driven by any cycling trainer ! Cycle indoor with a Bluetooth Smart trainer and play Arcade Running. 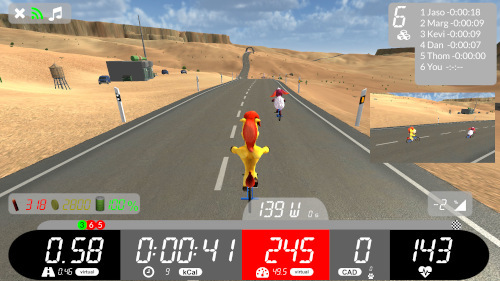 Virtual speed is estimated from your measured cycling power. There is plenty of stride sensor compatibilty since v2.0 has been published : you can now use a Xiaomi MI Smartband, a Garmin watch or any other Bluetooth footpod like for example Milestone one to play Arcade Running. There are also new 5k and 10k levels ! 01/03/17 : Mars challenge : win your Treadmill Arcade Running shirt ! Take part into our March challenge ! Run indoor with Treadmill Arcade Running, get the most total points among all players and win a shirt ! Don't forget to login on the BIPR website with Google+ and to complete your profile to take part into the challenge. See Total Points Leaderboard on our Rankings page. 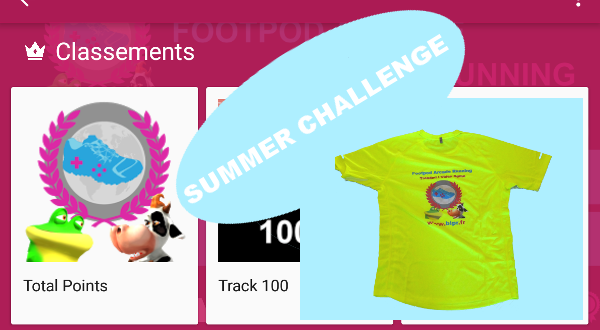 04/12/16 : December challenge : win your Footpod Arcade Running shirt ! 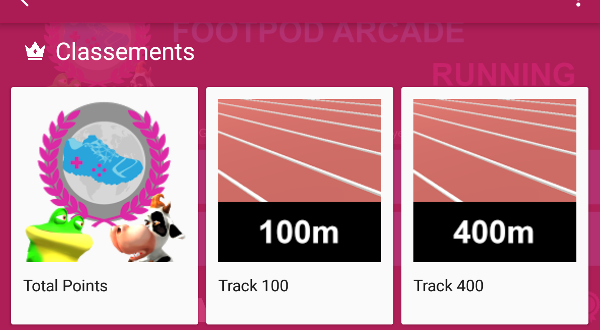 In December, run indoor with Footpod Arcade Running, get the most total points, login on the website with Google+, complete your profile with your mail adress and get your shirt ! See Total Points Leaderboard on our Rankings page. Good luck and have fun on your treadmill ! 27/11/16 : Take part in our Telethon challenge! Take part into the French Téléthon (fund rising event on 2nd and 3rd of december, see AFM Theleton) ! For each kilometer run between 28.11.2016 and 3.12.2016, Bipr will give 0.5€ to the association. If you want to participate, join our Strava club and go running ! 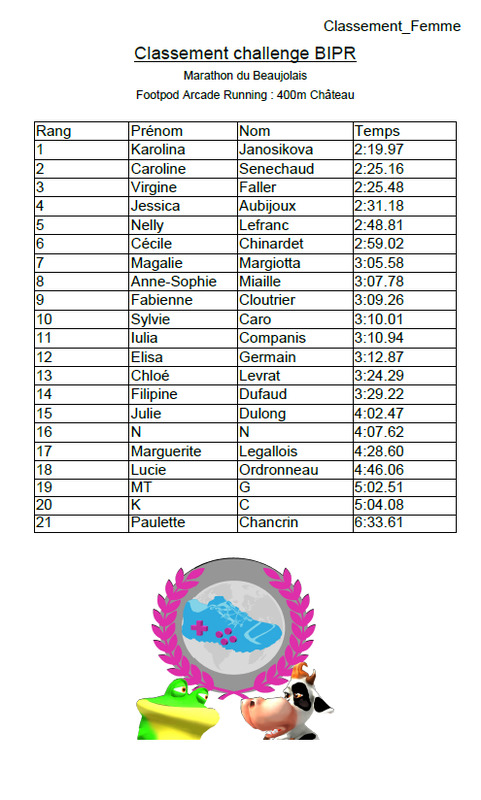 20/11/16 : Beaujolais marathon challenge results!